You must buy a minimum of 24 at a time due to manufacturer packaging. What’s the proper etiquette for using a charger plate at my table setting? 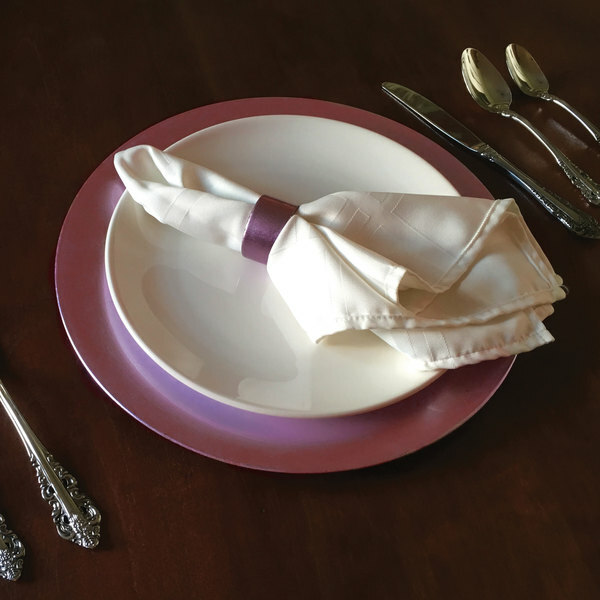 When preparing the table for your dinner, occasion or event, you should place the charger plate where the entrée plate belongs in a proper table setting. 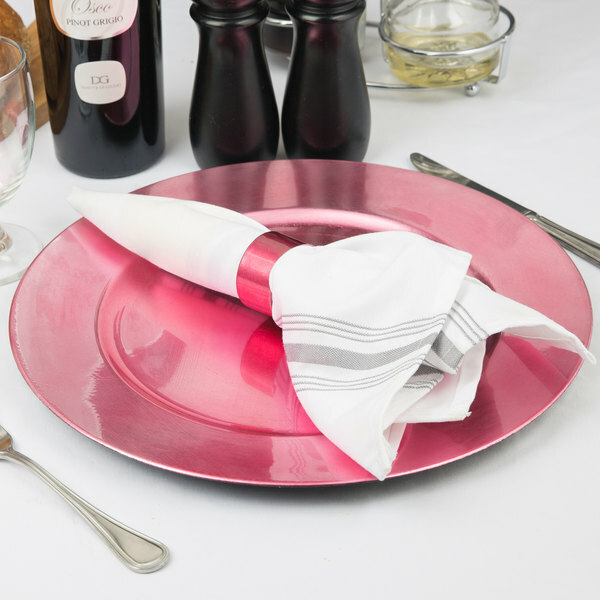 There should only be one charger plate per place setting, and silverware should be positioned in the same way as it would if a charger plate was not present. Once it comes time to serve, soup bowls, salad plates or entrée dishes are presented to guests and set upon the charger plate. When is it appropriate to take the charger plate off the table during a meal service? Deciding when to clear your table of all charger plates depends on the type of venue you have. Some restaurants have charger plates solely for decoration, and they are removed before guests are served any food whatsoever. Traditionally, charger plates are used for presenting soups, salads or appetizers and are removed before the main entrée dish is served. However, many restaurants today leave charger plates at the table setting throughout the entire meal. Rule of thumb is that charger plates should always be removed from guests’ place settings before dessert is served! Why do these charger plates look scratched or chipped? This specific line of charger plates are intended to have a used, tarnished, or distressed look to them. 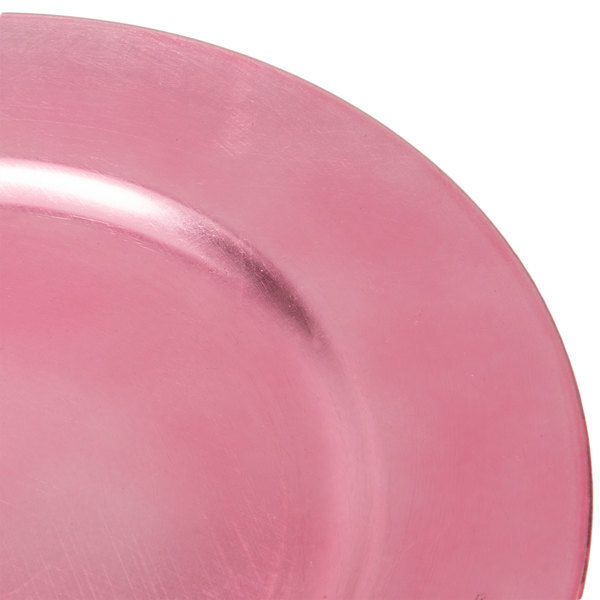 Add a stylish accent to any upscale table setting with these Tabletop Classics by Walco TRPK-6651 13" pink round charger plate. 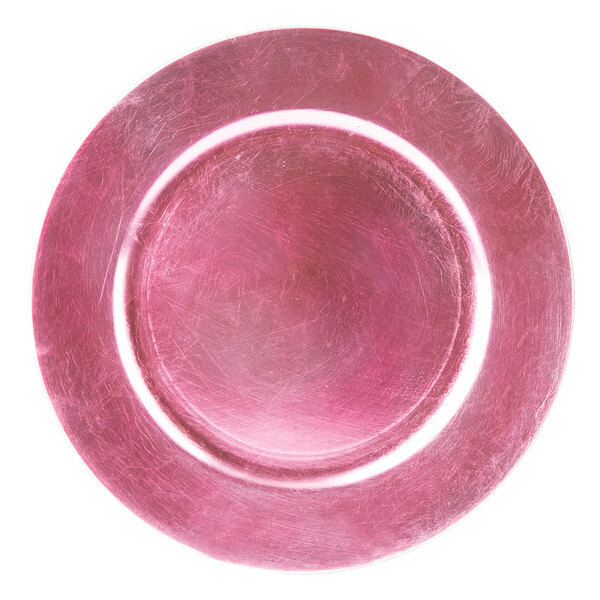 Boasting a vibrant, glossy pink finish, this charger plate is great for enhancing food presentations at your restaurant, catered event, or outdoor reception. With its 13" diameter, this charger plate can easily be paired with a 10" dinner plate and 7" salad plate to create a table with a mix of patterns and finishes. Featuring a lightweight yet durable polypropylene construction, this charger plate is built strong to ensure longevity throughout repeated use, from one event to the next. It will also help prevent spills and messes by catching any excess food and protect your table while your customers enjoy their meal. 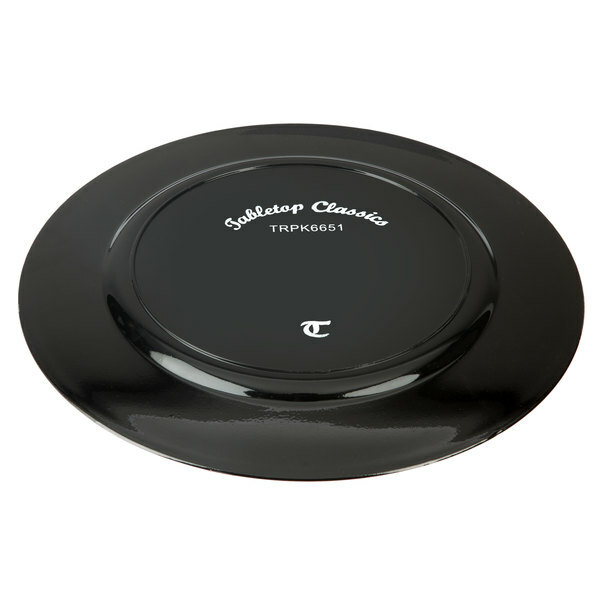 Easily place this charger plate under dinner plates and bowls for a professional, finished look. After the plates are removed, keep this impressive charger on your table to maintain a beautiful tablescape! These chargers have been our life savers. They are sturdy and in great condition and we are thankful!by ordering from this company was the best thing we could have ever did. Thank u!!!! Nice chargers that are sure to dress up any china you decide to pair them up with!! Affordable price makes them a must have for any event! !